Located in Kuwait City, the new Kuwait International Tennis Complex will house multiple outdoor and indoor courts with seating for more than 7,600 spectators in total. Under the complex’s glass roof, a garden conservatory offers visitors a serene dining experience next to a large water feature. The glass-like surface of this fountain is disturbed in several places by circular ripples appearing underneath from hidden bubbling nozzles. 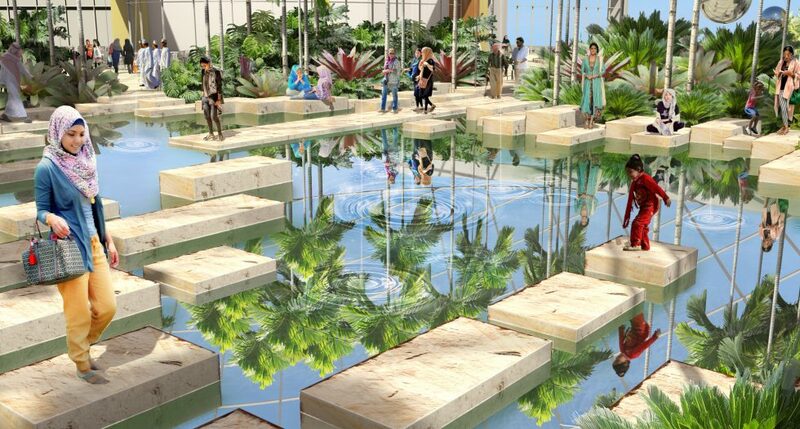 Visitors engage with the fountain through a raised paver walkway and scattered stepping stones that wade into the water. For this project’s water feature, ADE provided hydraulic, filtration, and chemical system design and engineering services.